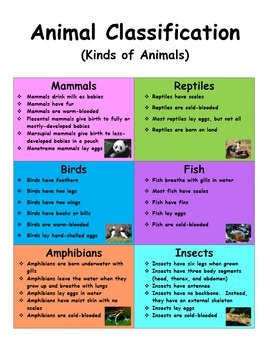 Animal Classification and Behavior Science Reading Pages! Unique World Animals! 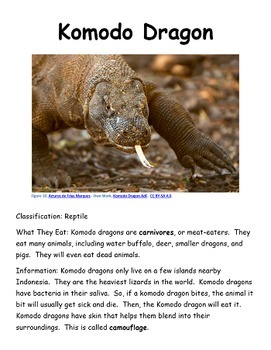 This file contains easy-to-read information pages about twenty-one unique animals from around the world! Each page contains a high-quality picture and a synopsis of each animal. 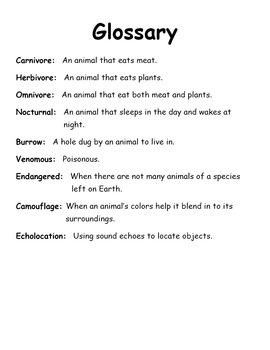 Kids will learn the words "carnivore", "herbivore", "omnivore", "camouflage", "echolocation", etc. 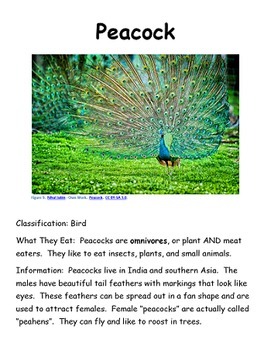 An animal classification page is included that lists the properties of mammals, birds, fish, reptiles, amphibians, and insects. Each animal page also lists the animal class. A glossary containing all of the vocabulary terms is included at the end. These pages will interest children from kindergarten through fourth grade, though the reading level is about a second or third grade level. If you enjoy this product, check out these other activities featuring the same animals from these reading pages: The Animal World Map , The Animal Coloring Pages , The Animal Letter Tracing Pages, and the Number Recognition, Counting, and Skip Counting Animal Pages. Or, save nearly 25% on these activities by purchasing them together in the Animal Activity Bundle for Elementary! If you like this product, please make sure to leave a rating! Thanks!